In the 80s, a huge excavation at Plaza de l’Almoina in the very heart of Valencia took place (location), revealing a remarkable amount of artifacts and ruins dating from the birth of the city up until the present day. 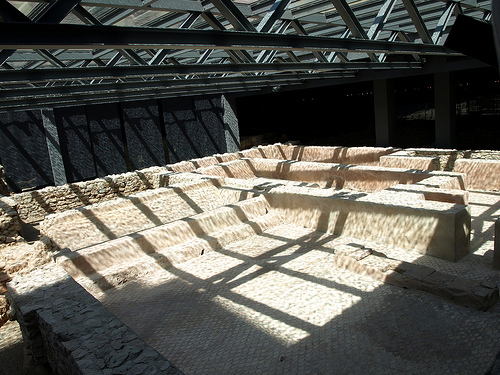 A few years ago, the city turned the excavation site into a fascinating museum, allowing visitors to wander through almost 20 centuries worth of progress. From sacrificial Roman wells, to intricate Islamic baths, the small square of l’Almoina, situated in the cross-hairs of the Roman Empire’s two main roads, has been the center of a lot of action. The exhibition spans 5 empires — the Roman Republic, Roman Empire, Visigoths, Islamic Empire, and Christian Kingdoms. The ruins have been pretty much left alone, and today visitors walk on top of them over vertigo-inducing glass floors. 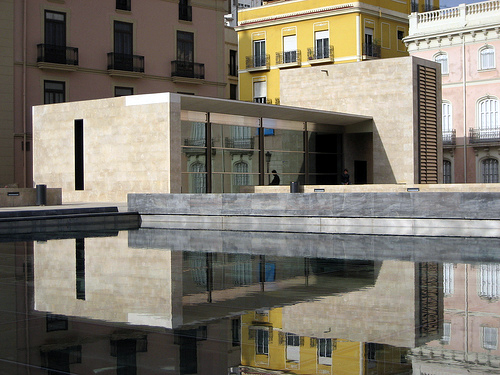 The museum is free on Saturdays, Sundays and holidays, and only €2 on other days. When we went, they only allowed entrance with a guided group — they leave every half hour or so depending on the number of visitors. If you can’t speak Spanish, it’s worth calling ahead — there are daily English tours, but not many.